Gynaecologist and obstetrician with many years of experience in both hospital and outpatient practice. 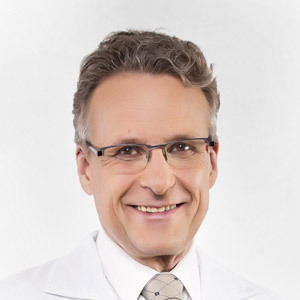 He specializes in hospital and ambulatory management of gynaecologic conditions, pregnancy care, treatment of infertility and recurrent miscarriages, and in consulting of the results of diagnostic tests; he performs standard gynaecologic examinations plus colposcopy and ultrasonography, incl. transvaginal and foetal USG. Takes care of the diagnosis and treatment of polycystic ovarian syndrome, menopause problems (with hormone replacement therapy, if indicated) and contraception. Performs gynaecological surgery as well.